The new logo’s design and colors are intended to complement the graphic representation of “A Just World for All,” developed to illustrate new Purpose, Vision, and Mission Statements adopted by the national setting of the church last fall. The new logo retains an updated version of the traditional element of the UCC comma — a much-loved and widely used emblem of the United Church of Christ introduced as part of the “God is still speaking,” identity campaign. That campaign quoted a line from Gracie Allen that her husband George Burns found among her papers after death. In a letter addressed to him were the words, “George, never place a period where God places a comma.” A variation on that line, along with the graphic comma, has been used since 2004 as a symbol and shorthand way to refer to “continuing testimony,” or the ever-unfolding nature of God’s word for new times. The new primary UCC logo consists of an updated comma emblem and the words “United Church of Christ.” “God is still speaking,” remains as the UCC’s tagline, and the new logo may be used with or without the tagline. 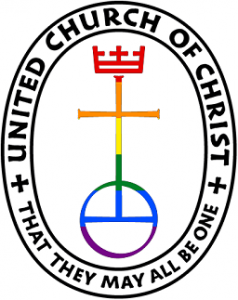 In addition to the comma, the UCC retains its original emblem for use by congregations and other entities of the denomination: the traditional “cross, crown, and orb” graphic, including the words “That they may all be one” (John 17:21), which dates from the founding of the United Church of Christ in 1957—a statement of the UCC’s intent to be a “united and uniting” church.